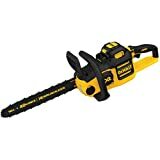 DEWALT DCCS690M1 40V MAX Lithium Ion XR Brushless 16″ Chainsaw, 4AH delivers the performance of gas with the convenience of cordless. Equipped with a powerful brushless motor and a low kick back 16-in Oregon bar and chain, this chain saw glides through a variety of cutting diameters with the cut speed of gas, and reliability of battery-powered equipment. For optimal convenience, the unit features auto-oiling with LubriLink and LubriWell delivering smooth cuts, long chain life and reduced maintenance. The quarter-turn oil cap allows for quick oil re-fills. It also features a tool-free tensioning system which allows for quick bar and chain adjustments with no additional tools required. This chainsaw is also equipped with a chain brake for kick back protection, along with a variable speed trigger for user control. Includes: DCCS690 Brushless Chainsaw, 40V MAX 4AH Lithium Ion Battery , Charger , 16″ Oregon Bar and Chain, Bar Sheath.